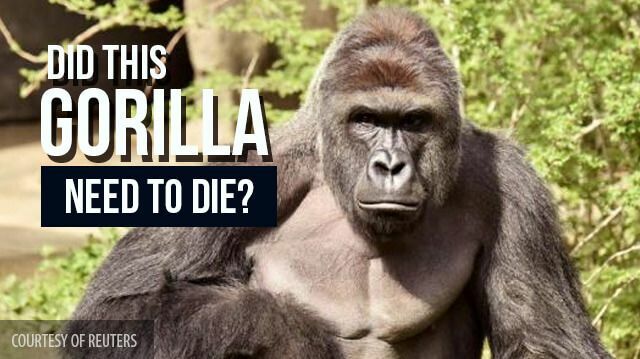 Zoo Shooting: Did Harambe the Gorilla Need to Die? What would you do if you saw a three-year-old child in a zoo enclosure with a 400-pound gorilla? Keepers at the Cincinnati Zoo were faced with this exact situation over the weekend, and their response has sparked outrage. Zoo visitors were shocked Saturday when a small boy somehow found his way inside an enclosure and came face to face with Harambe, a 17-year-old male western lowland gorilla. Witness Kim O’Connor said she watched on in horror as Harambe grabbed the child. “You heard the splash. People are yelling, ‘There’s a boy in the water. There’s a boy in the water,’” O’Connor told news outlet WLWT5. Minutes later, zookeepers responded by shooting Harambe and rushing the boy to a hospital. Local media since has reported that the child has been released from the hospital after being treated for non-life-threatening injuries. The boy’s name has not been made public. Another supporter of the group wrote, “It appeared to me the boy was in danger but it also seemed to me, the danger came from the screaming of the humans which seemed to excite Harambe.” Footage of Saturday’s crisis appeared to show Harambe dragging the boy away from the crowd of onlookers. At times, the gorilla appeared to be shielding the child. The zoo has defended the actions of its workers, stating that the gorilla was killed in order to save the life of the child. “We are heartbroken about losing Harambe, but a child’s life was in danger and a quick decision had to be made by our Dangerous Animal Response Team,” zoo director Thane Maynard said in a statement. Maynard argued that a tranquilizer was not an option. “Tranquilizers do not take effect for several minutes and the child was in imminent danger,” he said. “On top of that, the impact from the dart could agitate the animal and cause the situation to get much worse”. The creators of a Change.org petition called Justice for Harambe agree that zoo workers did the right thing and instead place blame on the parents. “This beautiful gorilla lost his life because the boy’s parents did not keep a closer watch on the child,” the petition’s organizers state. “We … want the parents to be held accountable for the lack of supervision and negligence that caused Harambe to lose his life,” the petition reads. It’s unclear exactly how the boy was able to enter the enclosure, though witnesses said the child told his parents shortly before the incident that he wanted to jump in with the gorillas. “The little boy himself had already been talking about wanting to … get in the water. The mother’s like, ‘No, you’re not, no, you’re not,’” O’Connor told WLWT5. According to the zoo, the child was then somehow able to climb a barrier before dropping 15 feet into the enclosure. One zoo visitor, Tony Bruce, told Cincinnati.com that the incident reflects a broader problem at zoos. “Parents just aren’t paying attention to what’s going on,” he said. Another zoo visitor, Brittany Nicely, told The New York Times that the mother shouldn’t be judged too harshly. “I don’t feel like it was neglectful … she had three other kids that she was with. She had a baby in her arms. It was literally the blink of an eye,” Nicely said. Cincinnati police do not plan to press charges against the parents. Meanwhile, others lay blame on the zoo itself. Primatologist and animal rights advocate Julia Gallucci issued a statement Sunday arguing the zoo should have had a “secondary barrier” in place. Maynard has responded by stating, “The barrier that we have in place has been effective for 38 years. Nevertheless, we will study this incident as we work toward continuous improvement for the safety of our visitors and animals,” he said. For now, Maynard said the zoo is mourning its loss. “We are all devastated that this tragic accident resulted in the death of a critically endangered gorilla,” Maynard said. “This is a huge loss for the Zoo family and the gorilla population worldwide,” he lamented. Found in central Africa, less than 175,000 western lowland gorillas exist in the wild. Populations of the primate have been devastated by habitat destruction, mostly due to logging, mining and agriculture. Was anyone to blame for Harambe’s death, or was it just a terrible accident? Tell us in the comments below. Previous articleDid the NFL Tamper with a Government Brain Health Study? Next articleTSA Shakeup: Will Summer Lines Be Shorter? Hey Buddy!, I found this information for you: "Zoo Shooting: Did Harambe the Gorilla Need to Die?". Here is the website link: https://www.thealternativedaily.com/zoo-shooting-harambe-gorilla/. Thank you.